- W. Haut Specialty Co., Inc.
W. Haut Specialty Company is your partner in profitability. 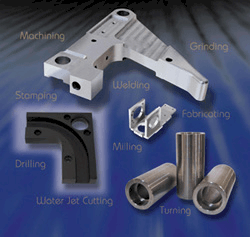 We are a JOB SHOP, experts in machining, fabrication, water jet cutting, welding, assembling, production milling, production turning, stamping and more. We serve many industries, including manufacturing, food, beverage, medical, architectural, aerospace, mining, tile, advertising, and others, in the production of component parts, water jet cutting, prototypes, tooling, fixtures, maintenance parts, gages, stampings and more. We are generally called upon to handle break down situations, complete programs of parts, welding and machining fabrications, accurate machining of component parts, turning, threading, etc. We can add instant help to your production process without you having to hire, train and pay for any extra fringe benefits for additional production staff. We also can take care of secondary operations such as heat treating, plating, part number etching or engraving, and shipping to remote locations. Please open up a world of possibilities by exploring our web page for specific information, pictures of completed parts and projects, capabilities and equipment list. We hope to be of service to you soon.